Guest writer Joe Laing, of El Monte RV Rentals, takes us on a ride through New England’s historic past. Any American who’s attended elementary school has read in a textbook about the Battle of Lexington and Concord as well as that of Bunker Hill. As home to the site of the “shot heard round the world,” and the opening battle of the American war for independence, New England appears regularly in most major history lessons. But among the lush landscapes and tiny harbor towns of the region are tucked several Revolutionary War sites that take history beyond just words on a page or dusty artifacts behind glass, truly bringing the past to life. Curious to learn more? Then load up your recreational vehicle (the modern equivalent of a horse-drawn wagon) and steer your gang straight into the action. Prime campgrounds and RV parks are situated near each site, so it’s simple to get your wheels turning towards an exciting historical escape to the North. Here, I’ve compiled a list of spots that are both entertaining and educational. These interactive sites will have your family traveling back in time, well, in no time. 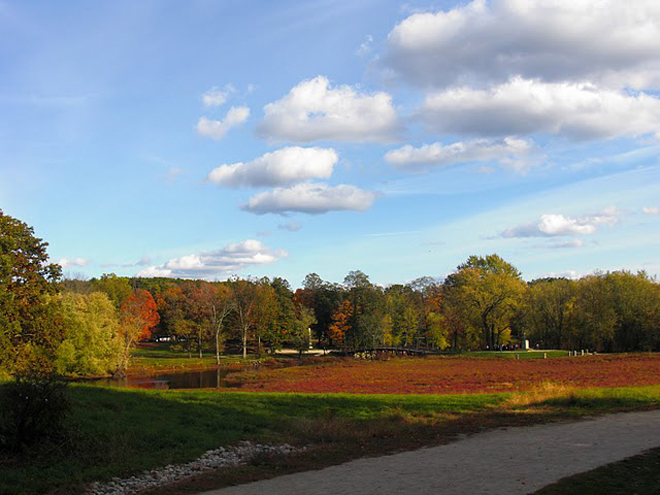 While it’s still unclear who let fly the first shot of the American Revolution on April 19, 1775, when a force of Minutemen stood their ground on Lexington Green against the British military patrol, the importance of the Minute Man National Historical Park in our country’s history is unquestionable. 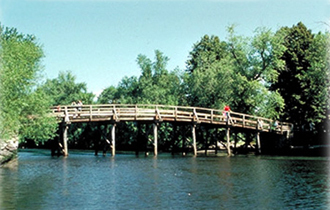 At this living history park located right outside of Boston, visitors can discover just how that famous day unfolded (including Paul Revere’s infamous midnight ride) with a multimedia video presentation and a journey down the well-marked five-mile Battle Road Trail (along the way, be sure to stop in the restored Hartwell Tavern and take time to reflect at Concord’s North Bridge). Rangers offer regular family programs at sites throughout the park, and engaging parades and historical reenactments take place on Lexington Green every spring on Patriot’s Day. 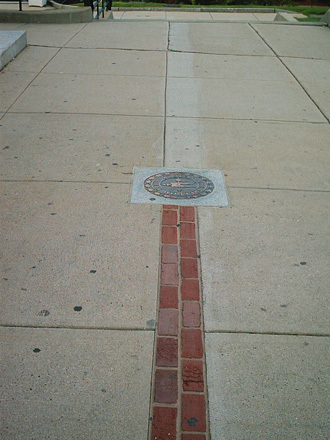 Visitors to the park can also take advantage of their proximity to Boston and wind their way along the 2½ mile Freedom Trail, which passes sixteen historical sites, including the Paul Revere House. Be sure to allow yourself time (and energy) to scale the 221-foot-tall Bunker Hill Monument, a granite obelisk that boasts 294 steps and a stunning bird’s-eye-view of the city. Stay nearby: Harold Parker State Forest, which covers more than 3,000 acres of central hardwood-hemlock-white pine forest and boasts trails, ponds, and plenty of recreational opportunities, offers wooded sites (sans electric and water hook-ups) at the Lorraine Park Campground. This five-acre hands-on nautical museum and research institute makes a splash telling the stories and cultural history behind Lake Champlain, detailing its role in everything from North American commerce to communication. But the true highlight of this destination is the full-scale working replica of the 1776 gunboat USS Philadelphia. Onboard, visitors can handle lines and interact with knowledgeable interpreters, who provide information on the British sinking of this gondola, part of Benedict Arnold’s fleet, between Valcour Island and the New York shore. Each August, as part of the museum’s American Revolution living history weekend, “Rabble in Arms,” the boat hosts shipboard life demonstrations and battle reenactments in the North Harbor. Stay nearby: There are a handful of RV campgrounds with full hook-ups within four miles of the museum: Button Bay State Park, on the shores of Lake Champlain, and Rivers Edge Campground and Hillcrest Campground & Cottages, both situated on nearby Otter Creek. 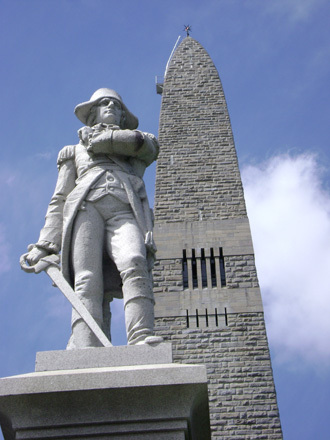 Another stone obelisk, this one towering 306 feet tall, stands guard near the New York border, to mark the location of the 1777 Battle of Bennington, during which the rebels struck a crucial blow to British troops under General John Burgoyne, who was after the colonists’ store of weapons and food. Unlike the monument at Bunker Hill, this fantastic display does include an elevator, which carries visitors to the observation floor for views of historic Bennington, as well as the undulating hills and valleys of Vermont, New York, and Massachusetts. Stay nearby: Just east of Bennington along Route 9 lay a couple of camping options. Greenwood Lodge & Campsites provides picturesque, wooded sites along with full hook-ups and plenty of recreational opportunities. Just past that is Woodford State Park, which does have dump stations but no water or electric hook-ups. Take a pleasant walk through time on this town’s historic green, the site of several major events during the American Revolution. Called “the heartbeat of the Revolution,” Lebanon Green is still primarily agricultural, but also houses the Revolutionary War Office, the home of Continental Congressman and Declaration of Independence signer William Williams, and the Governor John Trumball House. The mile-long green offers an interesting look at an early town settlement—and a wonderful place to burn off any road trip energy! Stay nearby: Half an hour southeast of Lebanon Green, you’ll find Strawberry Park, a 160-acre RV resort that features full hook-ups, multiple pools, an arcade, and lots of scheduled activities for the small fries. Joe Laing is the Marketing Director for El Monte RV Rentals. If you need an RV Rental for your New England trip be sure to check out their Boston Area RV Rental location in Sutton, MA. You can see more great RV vacation ideas in their Monty’s Musings RV Travel Blog.